We recommend using 17-22V power supply. This digital amplifier adopts dual USA TI TPA3116D2 chips, which can provide clear and clarified sound output without audible pop noise. Now we want to introduce you our newest preamp B07719G56B, which suits very well for this amp. 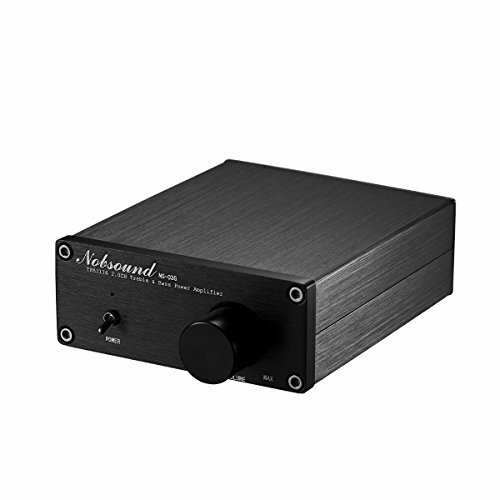 Compared with many TPA3116 amplifiers, it adds a NE5532 OP Amp Pre-level, which can ensure its excellent dynamics. The Germany VIMA MKP10 input capacitor gives it richer harmonic. It will be a good match for your bookshelf/computer/desktop speakers. You can use your phone/MP3/player/CD/TV/Echo Dot as inputs to drive 2~8Ohm speakers. Simple compact appearance design; Aluminum alloy body; Gilding RAC and crystal terminals; Luxury materials and excellent performance with low price. The power supply is not included. If you want to buy it from us, please search ASIN: B074J81XRB. Also, more details about its power supply is listed in the description.